Verve is the latest addition to the Thumper® line of massagers; an ideal tool to help in your quest to stay active. This single sphere massager is perfect for home use. It lets you target precise areas – areas you can only reach with a single head. Don’t let its small size fool you. This high quality yet cost-effective tool packs a lot of punch. 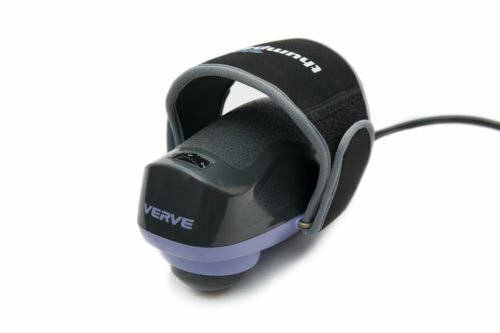 Thumper® Verve is easy to use; simply grip it like you would with a computer mouse, strap the flexible band across the back of your hand, and you’re ready to unleash its power. With a bit of practice, the use of the device and its effectiveness will become intuitive – the massager becomes an extension of your hand. 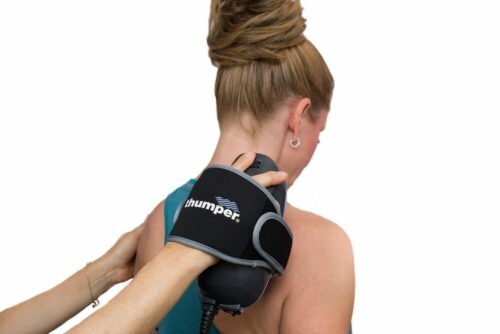 To maximize the effect of your massage and to minimize feedback onto your hand and wrist, glide or “heel” the Thumper® Verve along the muscles you are massaging. Do so with the palm of your hand. 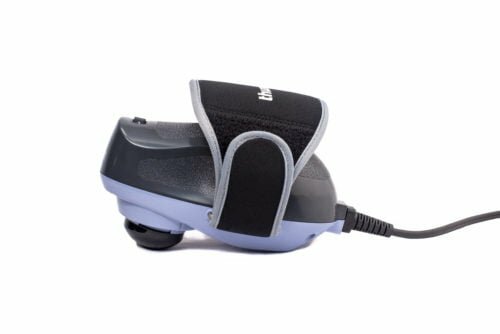 Allow the percussive action of the massage head do its work. Use your fingers to glide the device in the direction you want it to move. When you are ready to apply more pressure on a specific area, transfer or “rock” the weight on your hand forward from your palm onto your fingers. This transfer of pressure will increase the massage strength on that particular point of the body. Weighing only 2 lbs. and fitting right into your hand, Thumper® Verve helps you reach even the smallest of muscles in the tightest of places, delivering a focused single point massage. 3 interchangeable massage heads let you customize your massage experience, and achieve the best outcomes. Easy to clean; just wipe with damp cloth.